When people come to an opinion of pain, we can assume that they have moved into the “OK-“ side of the “OK scale” perceiving that there is a challenge or threat to their homeostasis, their well-being. It is also safe to assume that their goals will involve a desire to return to “OK” or “acceptable for continued homeostasis.” They come to us for help in achieving these goals. But what goals should WE have for the manner in which they get there? As an example, many people in pain worry that they have various spinal misalignments and the like. And despite that fact that we know any improvements seen from care have nothing to do with these misalignments, we also know that it would be SO EASY to just do a spinal manipulation (or whatever other intervention), and let them think that they just got a bone put back in place. If they feel better, does the end justify the means? Is “it worked” enough? The problem in this scenario is that an erroneous belief has been reinforced that this pain was the result of a bone out of place. So, the next time this person has a similar problem, they will be even more certain that this bone of place problem is real and, what’s more, it gets fixed with a specific method that only those who know the secret handshake can perform. In other words, the result is the belief that their health must be given to them by someone else. If you’re keeping score, this is bad. The manner in which they got to “OK” effects both their response to future bouts of “OK-“ and their dependence/independence in dealing with it. This is theft of self efficacy. 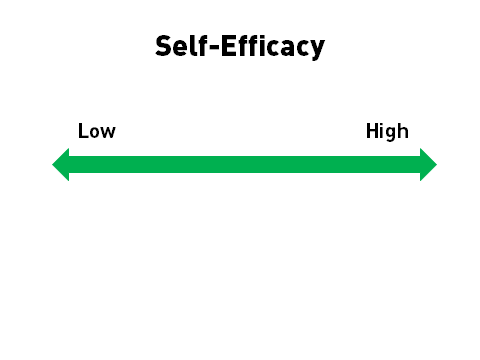 Based on the theory of social learning, self-efficacy describes the confidence the person has in his or her own ability to achieve a desired outcome (Bandura, 1977). We found that, when measured at the same time, both pain self-efficacy and fear of movement beliefs partially mediated the effects of pain intensity on disability at the onset of chronic low back pain. However, only improvements in pain self-efficacy beliefs partially mediated the relationship between changes in pain and changes in disability over a 12 months period. Self efficacy is important. We better serve our patients when we preserve, establish, or even build self efficacy. We want for them to move up the OK scale, AND do so with self-efficacy.